Native Americans have always loved and respected animals. Many Native American cultures have the belief that a person is assigned an animal upon the time of birth. The animals are honored, as they bring teachings (known as “animal medicine”) throughout a person’s lifetime. In 7 years, 1 female cat and its young can produce 420,000 cats! Unfortunately, many residents living on reservations face extreme poverty and limited access to veterinary care. They often lack the resources to manage the stray dog and cat population and care for orphaned animals on the reservation. A basic need, like spaying and neutering their pets, is sometimes a huge financial burden. Owners go without spaying and neutering their animals because they have a hard enough time paying for their own medical bills, putting food on their table and keeping a roof over their head. That is why we launched the Pet Promise service, a spay and neuter fund to help control the pet population on Native American reservations, through the ROAR Program. After telling Eevee's story, Dr. Holgate lamented, “the strays challenge us; it’s never what you prepare for, especially with the pups”. Pet Promise helps to provide a series of veterinary clinics, with subsidized low-cost spay and neuter options along with vaccinations for dogs and cats. They also provide preventive medicine (including flea/tick, mange and de-worming). 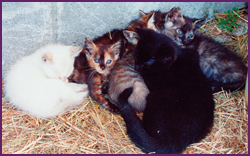 By spaying and neutering animals, it controls the pet population on the reservations. It also helps the animal in other ways. 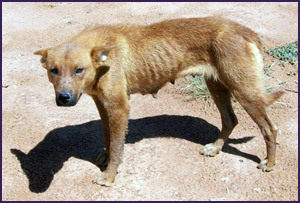 According to one estimate there are at least 1,500 stray dogs roaming the Navajo Nation alone. But the number may be four times this much. And there are many hundreds of stray cats as well. To intensify this problem, animal humane agencies estimate that in 6 years alone, 1 female dog and its offspring can be the source of 67,000 puppies! And in 7 years, 1 female cat and its young can produce 420,000 cats! Spaying and neutering animals reduces the urge to roam, which in turn makes your pet less likely to contract a disease, fight with another animal, get injured, or become a victim to traffic. Through this special fund, the ROAR Program can help lower that number by providing more mobile spay and neuter clinics on the reservation. We help control the pet population and educate owners — as well as give dogs and cats better lives.